Kilusang Mayo Uno (KMU) Metro Manila, Alyansa ng mga Manggagawa Laban sa Kontraktwalisayon (ALMA Kontraktwal) and Defend Job Philippines expressed their strong opposition against “Oplan Tambay” implemented by the Philippine National Police (PNP) during their press conference in Manila today. 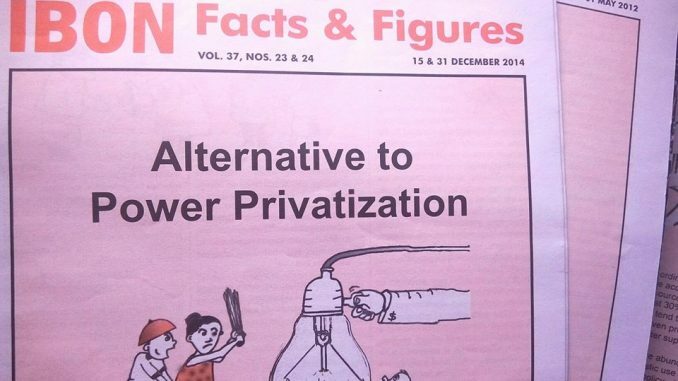 The group insisted that the said operations is a clear attack against the poor and the unemployed Filipinos. The groups challenged President Rodrigo Duterte to prosecute employers and companies that are still practicing contractualization or endo (end of contract) schemes, instead of arresting tambays (loiterers or vagrants). The group said the president must look into companies terminating workers in bulk to avoid recent Department of Labor and Employment (DOLE) orders to regularize them or to circumvent laws that require workers to be regularized. KMU Metro Manila, ALMA Kontraktwal and Defend Job Philippines also demand justice for the death Genesis “Tisoy” Argoncillo, 22, from Quezon City who was believed to be the first casualty of the PNP’s anti-loitering operations nationwide. 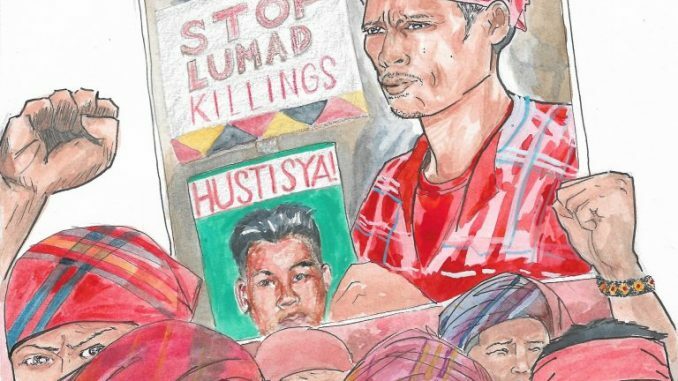 Instead of tambays getting killed, it is contractualization and joblessness that the government should arrest and kill, said the group. “For the longest time, contractualization has proven itself to be the main reason for employers to hugely terminate its workers. Such dismissals have been the primary reason why numbers of tambays increased and unemployment rate in the country worsened,” said Ed Cubelo, KMU Metro Manila chairperson. Labor unions facing struggles against massive terminations like Jollibee Foods Corporation (JFC), Pepsi Cola Philippines, Slord Development Corporation (makers of Uni Pak sardines), Liga ng mga Manggagawa sa Valenzuela City, Unioil Philippines, Jolly Plastics, Manila Harbour Centre and other workers’ groups joined the press con today. Defend Job Philippines said thousands of workers have been displaced with employers trying to circumvent different Department of Labor and Employment (DOLE) compliance orders and even using Duterte’s Executive Order 51 on contractualization to avoid regularizing workers with the primary company they engage work for. On June 18, JFC terminated its contracts with Toplis Solution and Staff Search Asia Cooperative, two of its agencies in the main commissary and warehouse in Parañaque City, leaving hundreds of workers jobless. DOLE named JFC the top corporation engaged in illegal labor-only contracting and initially ordered JFC to regularize 6,482 workers. “With the continuing refusal and disregard of JFC to the DOLE and its order, the fastfood giant management is clearly showing that it is not really serious in providing regular employment to its almost 29,000 contractual workers,” Rogelio Magistrado of Samahan ng Mangagawa sa JFC said. 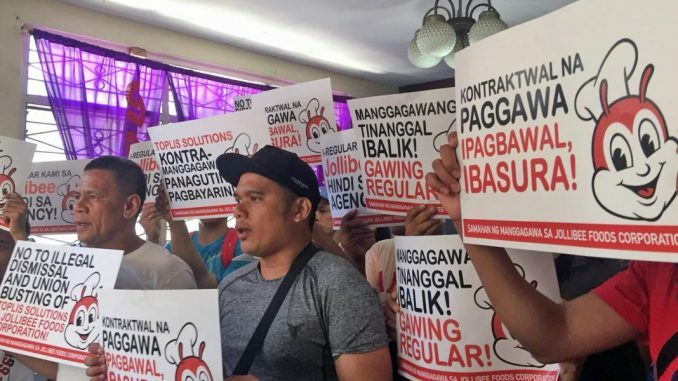 Jollibee workers demand regularization. Photo by Kathy Yamzon. Menawhile, Uni-Pak Sardines workers employed by Slord Development Corporation in Navotas Fish Port Complex said some 44 workers were dismissed last month following their efforts to demand regular employment and at least be given the P512 minimum wage in the National Capital Region. Uni-Pak workers have been receiving an average daily salary of P350 to P370 and have been serving the company for around three decades but have remained contractual up to their termination on May 11. The dismissed workers started a month-long protest camp-out at the Navotas Fish Port Complex gate on June 19 to call for their management to increase their wages, reinstate them and regularize all its workers. On June 2, workers from NutriAsia, Inc., condiments producer and distributor, launched their strike following the dismissal of the officers of the workers’ labor union and other workers who joined a ‘clap protest’ inside the factory, leaving 70 jobless. This was despite a February DOLE order to regularize 914 workers in NutriAsia’s Marilao, Bulacan plant. On June 11, more than 1,000 contractual workers from the Pepsi-Cola Products Philippines, Inc. in Muntinlupa lost their jobs after the company implemented the long-delayed shutdown of its deep-well reserve. Dismissed contractual workers have been serving the company for as long as a few decades. Labor groups vowed to continue the series of protests in various factories across the country in a lead-up to a big protest rally of workers near Malacañang Palace before Duterte’s third State of the Nation Address in July. The post Labor groups urge Duterte to prosecute erring employers and companies instead of ‘tambays’ appeared first on Manila Today.